My latest sewing obsession is quilts. I'd love to have a quilt on every bed in our house, I love that Bed and Breakfast feel a quilt can give to a room. But here's the deal...I don't want to buy any fabric to make them. I want to make quilts the way they were made during the depression era, using scraps of fabric from sewing projects and old clothes. I've scored some great fabrics on freecycle too. 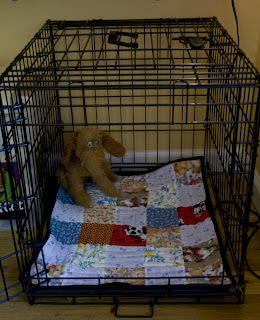 My first quilt was made for Dharma's crate. Now on to bigger ones!